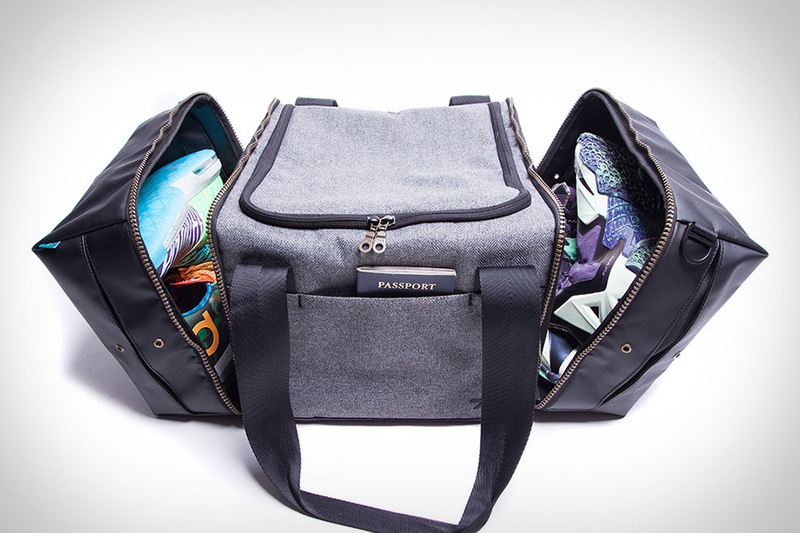 Give your kicks as much travel protection as your clothes with the Shrine Sneaker Duffel Bag. Designed to carry two pairs of sneakers up to size 20, this specialist bag features matte finish, weather resistant shoe compartments on either side of the main cavity, which is covered in charcoal herringbone fabric. Other features include a rear zippered pocket for your tablet, a quick-access front velcro pocket, a dedicated watch pocket, and enough room for three outfits and a dopp kit. You don't need to take a whole bottle of booze with you just to make a few drinks. With the Stephen Kenn Travel Cocktail Kit, you'll have everything you need in one handy pouch. The bag itself is made from leather, with canvas lining and elastic interior webbing, while inside, you'll find nine empty bottles, a mixing spoon, and a book that will teach you how to pack the kit for different occasions, as well as make 15 different cocktails, with recipes coming from some of the best bartender's in the world. Zippers get stuck. Bags get overpacked. Gadgets run out of juice. 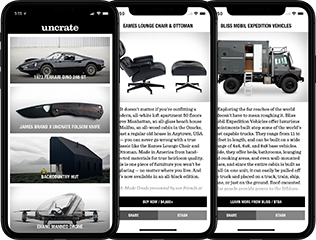 The Trunkster Suitcase aims to alleviate all of these problems with a unique array of features. To start, there's a sliding rolltop door that gives you access to your entire bag in one easy motion. Then there's a built-in, removable power pack that can charge your phone up to 9 times. There's also a built-in digital scale to ensure you stay below the weight limit, a side-to-side handle that allows for improved control and balance, a hidden compartment, and a durable aluminum and polycarbonate body. And should you ever lose your bag, there's also built-in GPS, so you can find your stuff no matter where it ends up. Filson's bags are known for the rugged reliability, but even the toughest of products need some TLC every once in a while. These Filson Restored Bags represent some of the most loved, most used items in the company's arsenal, having been purchased, used and worn until they needed repair, and then built back up by a restoration expert, giving them attributes like weathered fabric, distinctive stitching, and one-of-a-kind patina that you simply can't find on new items. Distinctive. Subtle. Normally those two terms contradict one another, but they live together in harmony in Tumi Bashford Duffel Bag. Featuring an all-black bridle leather exterior accented by a natural leather handstrap, this roomy overnight bag features an "X" pattern on the sides that sets it apart from its traditional contemporaries. Other features include a detachable shoulder strap, contrasting beige interior lining, and several interior pockets for organizing smaller items. It took three years of testing to develop the SDR D3 Traveller Duffel Bag, but the result is definitely worth it. This ultralight workhorse is made primarily from Cuben Fiber, a waterproof material that's four times stronger than Kevlar but weighs about half as much. Designed to fit in a business-class footwell or under an economy class seat, the bag supports a variety of carrying styles, and offers upscale details like YKK Uretek zippers, Petzl aluminium carabiners, anodized aircraft-grade aluminum loops and tri-glides, and Lhasa River stone zip pulls. And should you head out devoid of anything to carry, the entire thing rolls up to the size of a small sweater, making it ideal for hauling back the fruits of your travels. For travelers, there isn't much that is as important as your carry-on luggage, but innovation in the industry has been almost non-existent. The Bluesmart Carry-On Bag changes that, re-imagining the suitcase to solve all the problems of the modern traveler. This high-quality piece of luggage is controlled from your smartphone and allows you to lock and unlock it, weigh it, track its location, be notified if you are leaving it behind, or even charge your phone with its built in battery. Smart luggage for the smart traveler.